Europe's largest web host has launched a new hosted email platform. But while the system boasts functions similar to many found in Microsoft Exchange, it's actually open source. When 1&1 puts OpenXchange Inc's Smart Collaboration on sale in the UK, it will only cost you "a few pounds", says the company. The idea is that if you have a society, club or small business you can set up hosted email quickly and cheaply. "Open-source applications have always been of interest to us," says Andreas Gauger, CEO of 1&1. "But the Open-Xchange offering now shows that open-source has matured to the level where it offers an excellent mainstream email and collaboration product." "1&1 will continue to call upon open-source channels where it is clear that our customers could benefit from innovation and greatly reduced licensing costs," added Gauger. 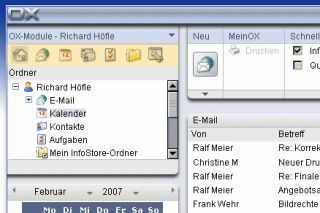 1&1 MailXchange will offer email, calendaring, contacts and task management together with advanced group features such as Smart Document Sharing. The new release joins a growing number of open source and alternative applications being used in preference to solutions such as Microsoft Exchange and Oracle Collaboration Suite. Google's Apps for Your Domain service might not be open source like Open Office, but they join a growing movement where smaller companies are refusing to be held to ransom by software behemoths. 1&1 has already launched the Open-Xchange platform in Germany and expects to do so in the UK, France and its growing US business by the early summer.